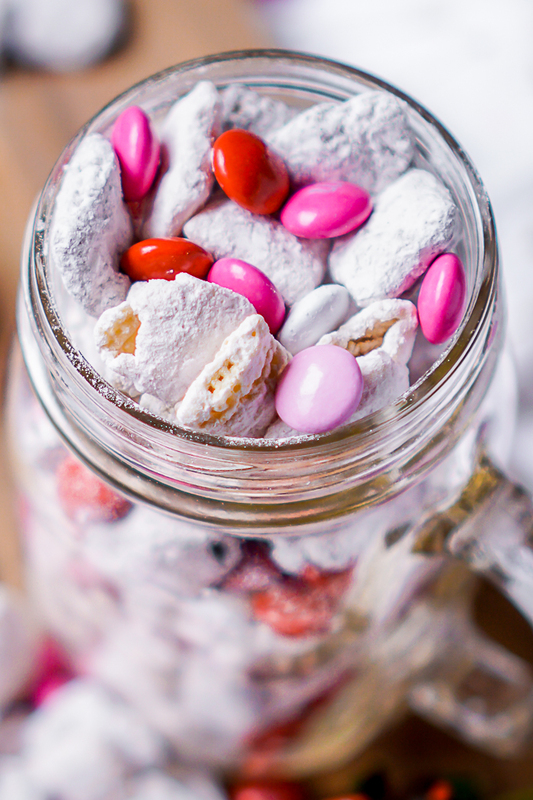 This puppy chow recipe is the perfect Valentine’s Day treat for kids and adults alike! Chocolate Covered Strawberry Puppy Chow is a fun twist on a classic flavor combination. You simply can’t go wrong with chocolate and strawberries! Chocolate Covered Strawberry meets Chex Mix in this delicious recipe for puppy chow! When I first made this recipe, we were knee deep in Liam’s 4 month sleep regression. We had been invited to our friend’s house warming, so with my own lack of sleep and new mom brain, I needed a fun Valentine’s Day treat for kids and adults that was easy to make and would make a good impression. No one wants to bring a dud recipe to a party, and this recipe for Chocolate Covered Strawberry Puppy Chow definitely did not disappoint. Puppy Chow or Muddy Buddies – whatever you want to call them – is one of those easy dessert recipes that everyone loves because it reminds them of childhood! It’s the simple recipes that really are the best and bring back great memories. Plus, as an adult, I love how easy it is to make! My friends and family are always so excited when I show up with a batch of chex mix puppy chow, and I’m happy because I didn’t have to spend a ton of time making it. The only draw back of puppy chow in this house? My husband tends to leave a trail of powder sugar. Traditional puppy chow is made with peanut butter, chocolate, and Chex Mix. You can find a classic Muddy Buddy recipe over on the Chex Mix website. The quick version of how to make puppy chow is to melt the chocolate and peanut butter together, pour over the cereal and stir until coated, then add to ziploc bags with powder sugar to shake it until thoroughly coated! We have a peanut allergy in the family though, so I tend to make my puppy chow recipes without peanut butter. I also find that adding peanut butter to special flavors of puppy chow gets in the way, like this chocolate covered strawberry puppy chow or my bunny chow. Peanut Butter – while delicious – is just such a strong taste. For this recipe, I coated half of my chex mix puppy chow in milk or dark chocolate and half of my chex mix puppy chow in white chocolate. I then added the two halves into two different ziploc bags with a combination of powder sugar and strawberry cake mix. The result is a perfect combination of strawberry, chocolate, and chex mix! The first time I made this, I found the strawberry flavor a little too strong, I think. It felt like it was overpowering the chocolate. When I made the second batch, I tweaked the powder sugar to strawberry ratio and then it was perfect for me! I’m telling you this in case you aren’t satisfied with the flavor ratio and find the strawberry too intense or not impactful enough, you can easily make adjustments to the batch. Just add more strawberry or powder sugar to the puppy chow recipe. You’re Only 15 Minutes Away from Chocolate Strawberry Puppy Chow! 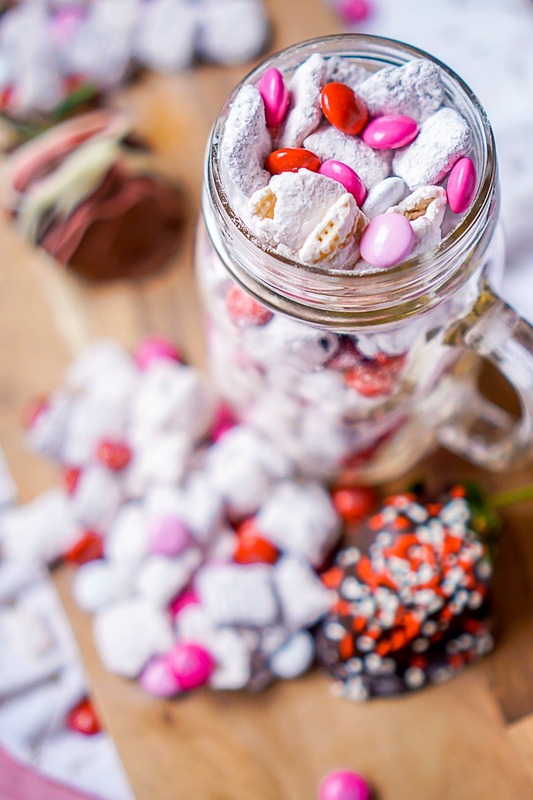 Chocolate Covered Strawberry Puppy Chow is a fun twist on a classic Valentine's Day treat. You simply can't go wrong with chocolate and strawberries! Melt milk chocolate in the microwave for 30 seconds at a time, stirring in between to prevent burning. Pour chocolate over 3 cups of Rice Chex cereal and gently fold/stir cereal until coated thoroughly in chocolate. Repeat steps 1 and 2 for white chocolate. Divide the strawberry cake mix and powdered sugar into two different large ziploc bags (or you could use tupperware with a lid). Add the chocolate coated cereal and white chocolate coated cereal into their separate bags. Seal and shake until coated. Dump onto a lined cookie sheet with parchment paper or foil and let cool. 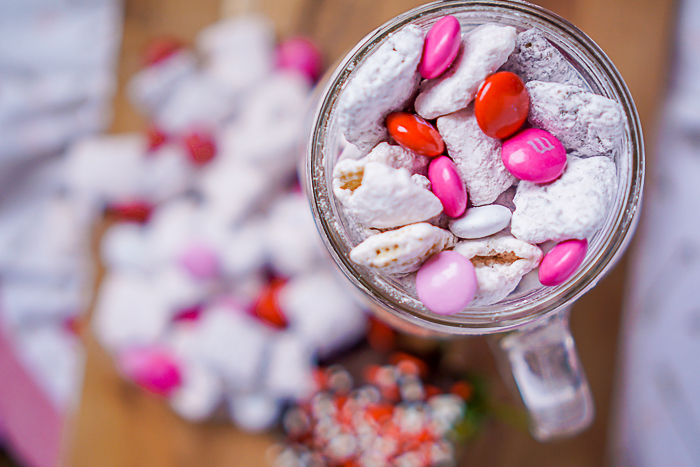 Add Valentine's candies for extra color and chocolatey goodness.